Being a graphic designer, Chris’ main tool of expression is Adobe Photoshop. By 3 a.m., he had finished the image and posted it on digital arts community B3ta as well as Twitter. He also uploaded it to Facebook as his profile image. “The response to it was surprisingly instant. There was an immediate flurry of “likes” and shares,” he says. Chris’ cathartic “photoshoppery” resulted in an image eventually seen by millions of people around the world — an homage to the cover of the Beatles album Sgt. Pepper’s Lonely Hearts Club Band, reinvented as a collage of the many celebrity deaths and other events that made an impact on him throughout the year. 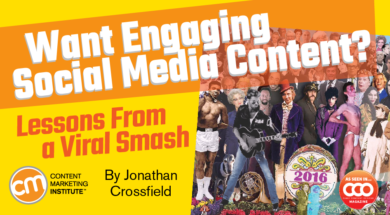 I’m the first to argue that there is no formula to creating viral social media content. However, we can draw some lessons from Chris’ hugely successful image — and how he followed it up. Chris believes his image worked primarily on an emotional level, tapping into how many people felt about 2016. As he explains, “People were feeling slightly fragile and confused. They wanted to share something that expressed how they felt, but they didn’t particularly want to share something about what had happened. They wanted to share something that expressed the emotion. Lesson: Social media and visual content can help people express complex ideas or emotions in a concise, relatable, and shareable way. Chris’ image isn’t only packed with emotion. Having captured attention, it rewards closer scrutiny. It is the ultimate Where’s Waldo, inviting people to seek and identify the various faces, with that little kick of satisfaction every time a piece of the puzzle is solved. Lesson: Instead of treating your followers as passive consumers, use your content to invite more interaction or foster a more communal experience. As more famous people died in the weeks that followed, Chris was inundated with requests for additions and found himself in debates about who should or shouldn’t be included. Chris found himself having to moderate threads and discussions that flared up. “If something got out of hand, I was moderating it in quite a personal way. I would step in politely and engage them, asking why they wanted this,” he says. “Saying sorry a lot helped, even though I didn’t really have anything to apologize for. ‘I’m sorry I didn’t include Juan Gabriel or Kimbo Slice.’ These names are burnt into my memory now. Lesson: If your content attracts a large audience, your job isn’t done. The conversation that follows can be just as important as the content itself. A single piece of content or image in a single tweet or update is incredibly ephemeral. The audience will quickly move on if you don’t keep coming back to capture their attention anew. However, regularly reposting the same thing over and over in the hope of kick-starting a snowball of engagement can look desperate, if not a bit spammy. Yet Chris had unwittingly created a content series as he began posting updated versions following each new celebrity death. Even Chris isn’t certain how many versions he produced between Nov. 9 and the final (to include Debbie Reynolds) on Dec. 28. It’s also hard to say how many people saw or interacted with the image, with so many people sharing and reposting so many versions across so many channels. What isn’t in doubt is that whenever Chris posted a new update the numbers snowballed exponentially. Just after Christmas, Chris’ tweet containing the penultimate version (to include Carrie Fisher) attracted 5.5 million impressions alone. Lesson: Consider how you might build upon a content idea to justify multiple repostings — maybe with a themed series or through regular updates. Chris soon realized that meme culture threatened to seize control of his content once it entered the badlands of social media — something many brands also struggle with. It wasn’t long before other social media users began to create and share their own updates. “There were a lot of Harambes (the gorilla shot by a Cincinnati Zoo worker in May 2016). That wasn’t really my thing. I wasn’t really aware of it as a phenomenon. My younger colleague was very aware of it and kept needling me to do it. I think that encouraged me not to do it even more,” he says. Lesson: Social media audiences quickly take your content into their own hands if you don’t respond or adapt quickly enough. Chris did produce a 2017 edition, which also spawned multiple versions and attracted an impressive number of interactions. However, he hasn’t decided yet whether there will be a 2018 edition. A version of this article originally appeared in the August issue of  Chief Content Officer. Sign up today to receive your free subscription to CCO.